Student enrolment and orientation documents – You will need your electronic Confirmation of Enrolment (eCoE) and student information pack, which you will have received from your institution. Contact details – You may want to have a list of emergency contact details for family, as well as your embassy, accommodation and institution details. If you have used an education agent, keep their contact details on you, in case you need to contact them once you arrive in Australia. You should also be aware that as a routine part of their work, Customs and Border Protection officers may question travellers at any time, and trained dogs may also be used to detect illegal drugs or prohibited imports. If you are in doubt, declare your goods or ask a Customs and Border Protection officer for advice. Declaring goods does not necessarily mean your baggage will be examined. People who deliberately break Australian Customs and Border Protection regulations could be fined(opens in a new window) or taken to court. You can also find information at the Australian Customs and Border Protection Service(opens in a new window) website. Students are often surprised by how strict the Department of Agriculture, Fisheries and Forestry (DAFF) biosecurity requirements can be. Live animals and plants, plant material, animal products and some food from overseas could introduce some of the world’s most serious pests and diseases into Australia, devastating our valuable agriculture and tourism industries and unique environment. So it’s important to remember that when you’re packing to not bring fresh fruit and vegetables, meat, poultry, pork, eggs, nuts, dairy goods and live plants and seeds, as they will not be allowed into the country. You can also find information on what you can bring or send to Australia at the DAFF web site(opens in a new window). If you’re in doubt about whether your goods are prohibited or not, declare them on the Incoming Passenger Card which you will receive on the plane. On the spot fines can apply for not declaring items. When you arrive at an Australian airport, you will first need to go through immigration and customs clearance. If you need help finding your way around, just ask the airline staff or one of the border officials in the arrivals area. A clearance officer will check your travel document and visa, and once cleared you will be able to collect your luggage to go through customs and quarantine clearance processes. More information on what to expect when you arrive at the airport is available at the Department of Immigration and Border Protection(opens in a new window) website or Australian Customs and Border Protection(opens in a new window) website. You should arrange accommodation before you arrive in Australia, even it is just for the first few days. Have your accommodation address written in English ready to show the taxi or hire car, or detailed directions if you are using public transport. If your institution is picking you up from the airport they will take you exactly where you need to go. Some institutions run an orientation week (also known as ‘O Week’) for new students. This is typically held at the start of the year and during the week; you will learn about your institution, take tours of facilities, and meet people who will also be studying at your institution. You can usually find more information about your institution’s orientation week on their website, such as a full schedule of activities. If your institution has an ‘O Week’ it is important that you attend to learn how to get the most out of your institution and study experience. Remember, if you have any problems or questions once you leave the airport, call your institution’s international support staff. These details will be in your enrolment and orientation information. The costs will vary depending on your chosen state, city, and type of accommodation. Temporary housing which may be offered through your institution while you get settled. Talk to your institution’s international support staff or check their website for details. You can rent or ‘lease’ a property by yourself or with friends. This can be done through a real estate agent or privately. When renting a property you will need to pay a security deposit or ‘bond’ (which is usually four weeks rent), as well as rent in advance (also usually four weeks). The bond is held to repair any damage that you, your house mates or house guests cause to the property while renting. Some, or all, of this amount may be refunded to you once your tenancy agreement has terminated. Campus living can be a great option to minimise travel. Most universities have comfortable and furnished apartment-style living on campus or close by, sometimes with cleaning and meals included. Contact your institution directly to find out the accommodation options they have available and how the costs compare with organising your own accommodation. There are many consumer protection and support services available for international students. This includes services provided directly by institutions as well as those provided by a range of state, territory and federal government departments. Would like to make a complaint about a business. Visit australia.gov.au(opens in a new window) or www.consumerlaw.gov.au(opens in a new window) to find the relevant government agency for where you are living and studying. The Overseas Students Ombudsman (OSO) investigates complaints about problems that overseas students have with private education and training institutions in Australia. The Ombudsman’s services are free, independent and impartial. You can find out more about this service on their website: www.oso.gov.au(opens in a new window) The OSO also produces an email newsletter for international students. You can subscribe to the newsletter on the OSO(opens in a new window) website. Receive a refund of your unspent tuition fees. Under the Tuition Protection Service international students have a number of rights and obligations. For more information visit the Tuition Protection Service(opens in a new window) website. Clubs, societies, sport and fitness facilities. Many Australian education institutions are like mini communities, so not only will you be able to undertake your studies amid world-class learning facilities, you will also be able to enjoy the social side of studying as well. You can join a club or society, improve your health and fitness in the gym, join a sports team, attend a social event, or volunteer for community service. To find out full details of what your institution provides please check their website directly. Council of International Students Australia (CISA)(opens in a new window) – national peak student representative body for international students studying at the postgraduate, undergraduate, private college, TAFE, ELICOS and foundation level. Australian Federation of International Students (AFIS)(opens in a new window) – assisting international students in maximizing the scope and potential of their experience living and studying in Australia. Most institutions in Australia also have their own student associations – you can visit your institution’s website for more information. Many institutions offer services for students who require assistance with their studies because of a disability or chronic medical condition. These may include voice-recognition software, hearing aids or note-taking services. You should contact your institution several weeks before you arrive to make the appropriate arrangements for your specific needs. Institutions must make every effort to accommodate a student with a disability. However, the institution is not legally required to make modifications if the changes involve major difficulties or unreasonable cost. The institution has to prove the changes are unjustified and, before making such a claim, must have direct discussions with the student and seek expert advice. If you are experiencing a problem with your institution, you should first talk to staff at your institution. If informal discussions do not resolve the problem, you have the option of lodging a formal complaint. Institutions are required to have a process for students to register complaints. If you feel you have a legitimate complaint that is not being recognised by your institution, you should approach the Australian Human Rights Commission. Confidential enquiries can be made by telephone but a formal complaint must be lodged in writing before the commission can take action. Find out more about disability rights in Australia at the Human Rights and Equal Opportunities Commission(opens in a new window). While many larger institutions have childcare facilities with trained staff, there are also a wide variety of private and not-for-profit childcare centres available around Australia. The Australian government provides financial assistance to help parents with childcare costs. International students who receive direct financial assistance from the government, through a government scholarship, may be eligible to receive the child care benefit. To find out if you are eligible for child care financial assistance, read more at the Australia.gov.au(opens in a new window) website. Service details – Life threatening situations, such as a car crash or a fire. Service details – Police attendance for non-urgent matters. Service details – Lifeline provides crisis support, suicide prevention and mental health support services across Australia. These can include stresses from work, family or society and physical and mental wellbeing. Lifeline offers support services by phone or through their online chat available on their website. Service details – If you’re between 5 and 25 and you’re feeling depressed, worried, sad, angry or confused about things like your studies personal relationships, Kids Helpline offers free 24 hour, 7 day telephone counseling support (anonymous if you prefer). Service details – Provides advice on the management, assessment and treatment of poisonous products including non-prescription pharmaceuticals, household and industrial chemicals, and plant and animal venom. Service details – If you, or anyone you know, has experienced or is at risk of sexual assault, call one of the state-based sexual assault counseling services. These provide a free 24 hour, 7 day a week telephone counseling service (anonymous if you prefer). Many are connected to hospitals or government health departments to help you if the assault has left you with injuries. You must remain enrolled and maintain satisfactory course progress and attendance. If you wish to change your qualification level you will need to apply for a new student visa. Provide your Australian address to your institution so they can contact you, and let them know if you change address. You must continue to be able to support yourself financially while you’re in Australia. Do not breach the working conditions applicable to your visa. The Department of Immigration and Border Protection(opens in a new window) website provides all information in relation to visa requirements, responsibilities and compliance. Education agents can also help with your visa application and paperwork (as well as your course application). Most student visas allow you to work for up to 40 hours every two weeks while your course is in session, and unrestricted hours during any scheduled course break, but before you undertake any paid work you need to make sure your visa allows you to work. Find out more at the Department of Immigration and Border Protection(opens in a new window) website. Paid or unpaid internships can be a great way to get exposure to the professional, financial and creative industries. Learn more about getting an internship on the Internships page in the Education System section of this website. Most employers in Australia are covered by an ‘award’, which sets minimum wages and conditions for a given field of work or industry. To find out more about your work rights visit the Australian Government’s Fair Work(opens in a new window) website. This covers all workers in Australia, even if you are on a temporary visa. Visit Safe Work Australia(opens in a new window) for more information or to download(opens in a new window) the latest checklist. 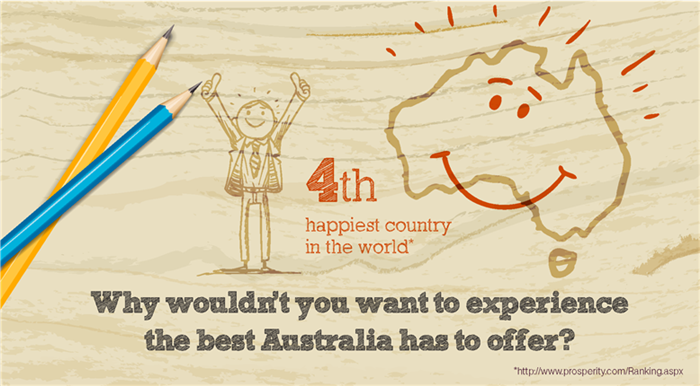 You will also need to get a tax file number to work in Australia. Visit the Australian Taxation Office(opens in a new window) website to find out more information on getting a tax file number, as well as information about paying taxes in Australia. If you experience financial trouble while in Australia, talk to your institution’s international student support staff for assistance. Australia is generally a very safe place to live and study. The 2011 OECD Better Life Index(opens in a new window) rated Australia 9.3 out of 10 for safety, one of the highest ratings awarded to any country. But it is still important to look after yourself and be aware of the risks that exist – and ways to minimise them. This is particularly important for when you first arrive and are adjusting to your new way of life. The assistance and emergency networks in Australia are widespread and well equipped for any potential emergencies. Fire, ambulance, and police services will be able to provide you with any health and safety assistance you may need. Someone has been seriously injured or is in urgent need of medical help. If your life or property is being threatened. If you have just witnessed a serious accident or crime. Most institutions provide on-campus security who can be easily contacted. Their contact details should be in your enrolment information, but if they are not, contact your institution’s international student support staff to get their phone number or office location. If it’s a life-threatening emergency, you should still call 000 even if you are at school or on campus. Leave valuables at home if you don’t need to take them with you. This includes jewellery, electronic equipment such as iPads and your passport. If you’ve recently arrived and don’t have anywhere permanent to live yet, talk to your institution’s international student support staff about secure storage facilities on campus. Don’t carry large amounts of money with you. You can access your money at ATMs found in shops, supermarkets, petrol stations, shopping malls, bars, shop fronts and many other public places. When using internet, like anywhere in the world, you should protect yourself against spam, online scams like ‘phishing’, online bullying and identity theft. You can find more information about protecting yourself online atAustralia.gov.au(opens in a new window) Many Australian internet service providers also offer guidance so check their website as well. Safety at home is important, no matter where you live. Here are some tips to help keep you and your home safe. Be careful of the information you give out to strangers through the internet, on social networking sites, or over the phone. If you are not at home or go on holidays do not make this information available to strangers. Smoke alarms will alert you to smoke on the property, so don’t remove the batteries or tamper with them. If you live in a rental property, hostel or hotel it’s the law to have smoke alarms fitted. If your property doesn’t have them, talk to your landlord or real estate agent. If you come home to find evidence of a break in (broken window or door lock), contact the police from a safe location. Only swim at patrolled beaches (a beach where there are lifeguards on duty – look for signs) and always swim between the red and yellow flags where lifeguards can see you. For more information on water safety visit the Surf Life Saving(opens in a new window) website. Wiring and electrical devices can overheat from too much use, especially in older buildings, so don’t overload powerboards or double adaptors. In case there’s a fire at home, plan a way to get out in advance. Don’t block doorways or windows, and make sure you can open your windows – they can get stuck in older buildings. Have a specific place for keys and your phone, so if you have to leave in a hurry you know exactly where they are and can call emergency services. As an international student in Australia, you are required to have Overseas Student Health Cover (OSHC) for the entire duration of your study in Australia. But there are also other types of insurance which you may find useful. International students undertaking formal studies in Australia, and their dependents (for example, spouses and children under 18 years old), must obtain OSHC. It includes cover for visits to the doctor, some hospital treatment, ambulance cover and limited pharmaceuticals (medicines). OSHC insurers can provide a range of different OSHC products. These may range from a basic product which covers only the compulsory minimum services to comprehensive products which cover, in addition to the compulsory minimum services, extra services as specified under the particular policy. You can find more information, including a list of the providers and average costs, on theDepartment of Health(opens in a new window) website. Remember, the Department of Immigration and Citizenship requires overseas students to maintain OSHC for the duration of time they are in Australia. For further information please visit the Department of Immigration and Border Protection(opens in a new window) website. Home and contents insurance covers the building you live in and your belongings, such as furniture, clothes and appliances. If you rent a property, building insurance is the responsibility of the owner and you do not need to worry about it. But contents insurance is worth considering if you have valuable items you couldn’t afford to replace very easily if something happened to them. If you purchase a car, motorbike or other vehicle you will need to consider what type of insurance you will need to purchase. Depending on what state or territory of Australia you live in there may be compulsory insurance you need to purchase. For example, in NSW you must purchase Compulsory Third Party insurance which covers you for personal injuries caused to someone else in an accident. You should check with the relevant government agency in your state or territory to find out what, if any, compulsory insurance you might need. You can also choose to purchase vehicle insurance that covers your car for accidental damage, malicious damage, theft, fire, flood or storm. There are a wide range of providers in Australia that offer vehicle insurance so make sure you research your options and consider what your specific insurance needs are before you purchase vehicle insurance. Australia has a range of choices when it comes to managing your money, from banks that cover the whole country to local credit unions and building societies. Here are some quick tips on setting up your bank accounts. You can set up a bank account before or after you arrive. You may also need an Australian Tax File Number (TFN). You can find information about getting a TFN at theAustralian Tax Office(opens in a new window) website. Financial or student support officers at your university or college will be able to give you information on how to set up a bank account. You can also read advice from the Australian Government’s Moneysmart(opens in a new window) website. The basic unit of Australian currency is the dollar (AUD). There are 100 cents in one dollar ($1). Australian dollar notes come in denominations of $5, $10, $20, $50 and $100. Coins are issued in denominations of 5c, 10c, 20c, 50c, $1 and $2. Prices are rounded up or down to the nearest 5 cents in shops and supermarkets. For example, you would pay $1.95 for an item priced $1.97, but $2 for an item priced $1.99. You can withdraw your money at automatic teller machines (ATMs) which can be found all over Australia. It is generally free to withdraw money from an ATM that is associated with your financial provider. Be aware that if you use another provider’s ATM they will usually charge you a fee. The ATM will advise you of the fee at the point of withdrawal. Even if you haven’t set up a bank account before you get here, most ATMs recognise international cards, so you will be able to use your credit or debit card from your home country. Just remember that there are fees associated with withdrawing money from your home account including transaction fees and the currency exchange rate. These vary by provider so check with your home financial provider before you arrive in Australia. Australian banks offer various services for moving money to and from Australia. For all these services, fees and charges will apply. These can be found on financial provider websites. You can have funds electronically transferred into your Australian bank account from overseas banks. To send money to another country you will need to provide the banking details of the person you wish to send money to. Your financial provider will then electronically transfer the funds from your account to their account. The Australian Banking and Financial Services Ombudsman assists individuals and small businesses to resolve complaints concerning all financial services provided by banks. For example, there may be an instance where you see that money has been withdrawn from your bank account without your consent. In this case, it may be necessary to talk to the banking ombudsman to resolve the issue. Free interpreter services are available. For more information on the banking ombudsman visit: www.fos.org.au(opens in a new window) or call. The Australian Capital Territory Government provides transport concessions to international students on presentation of their formal student identification card or upon successful application for an ACTION Students Concession Card. For more information on obtaining a Student Concession Card for the ACT please visit theACTION(opens in a new window) website. International students are generally not entitled to transport concessions in NSW. However, tertiary institutions are now able to offer international student discounted MyMulti passes, allowing students to save up to 35 per cent on the cost of travel on buses, trains, light rail and most ferries throughout Greater Sydney. More information aboutinternational student travel discounts(opens in a new window) is available. A small number of international students whose study is fully-funded under specified Australian Government scholarships may be eligible for transport concessions. For further details, please refer to TfNSW’s Guidelines for Issuing NSW Tertiary Student Concession Cards (pdf 209KB)(opens in a new window). Full‐time international students studying at a Queensland education institution in a course approved by Centrelink for Austudy, Abstudy or Youth Allowance purposes are eligible for concessions on public transport. The Translink(opens in a new window)website provides full details on Queensland concession fares. Education Queensland International(opens in a new window) also provides details on the Fee Exemption Policy(opens in a new window). The South Australian Government provides transport concessions for all international students on presentation of their formal student identification card. Further information on fares and conditions can be found at Adelaide Metro(opens in a new window). Students may be eligible for a concession card(opens in a new window) if they are studying as part of an approved overseas exchange program, if they have refugee status or if they hold an Australian Development Scholarship. Please check with your education provider to find out if you are eligible. More detailed information on Victoria’s transport system can be found at Study Melbourne(opens in a new window). International students who study in Tasmania qualify for the same travel concessions as local students. For detailed information on transport concessions in Tasmania please visit the Tasmanian Government Discounts & Concessions(opens in a new window) website. For information about current concession passes visit the Transperth(opens in a new window) website. For general information about the public transport system in Perth visit the Study WA(opens in a new window) website. If you hold a current drivers licence in your home country, you might be able to drive in Australia without sitting for any further driving tests. But remember that many state and territory governments require you to get an Australian drivers licence if you are here for more than three months. Your licence requirements, and any driving restrictions, are managed by the state or territory government where you are living. Visit the relevant state or territory government website or go to australia.gov.au(opens in a new window) to find out more.